These are all completely rando but I went to Sally's to get the french tip guides and couldn't resist picking up three polishes - Nina Ulta Pro in Sweet Nothings and China Glaze's In The Lime Light popped out at me. At the counter I snatched up the little glitter rounds for $.99 (no name). It's a mauve-ish glitter. I then had to go to my favorite place in the world - not my wallet's - Target. Saw Sally Hansen's Insta-Dri in Snappy Sorbet, had to have it because it screamed melon at me. I've been drooling over Nicole's heart glitters and also bought the baby pink heart glitter in Love Your Life. I'm excited to try them! 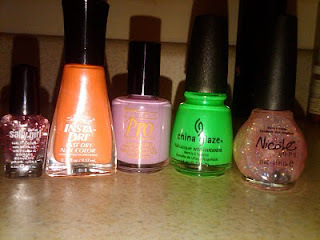 I'm dying to get China Glaze In the Lime Light myself. Jealous. That Nina looks very pretty--is it a creme or a shimmer? I think you got not only a good selection of different colors but also different brands. I'm looking forward to your swatching. Snappy Sorbet looks nice, can't wait to see a swatch! KarenD it's a nice opaque creme. Beata I've only been going to one Sally's and need to start scouring other locations for different shades - it seems a bit sheer. We'll see what it goes on like. Great haul!! I love that Nina Pro color so pretty. I need to go to Sally's soon I have a 20% off coupon that expires at the end of the month. Great haul you've got here! That Nicole nail polish looks divine =) Why oh why do we not have these awesome brands in Syd?!! 'chelle it has to be difficult seeing all the things you want and can't get =( - don't worry I'm sure you have plenty we can't get out hands on. ABOP I was thinking it was a light lavender until I brought it home - I guess my quest continues! Can I Have That - With a Cherry On Top?